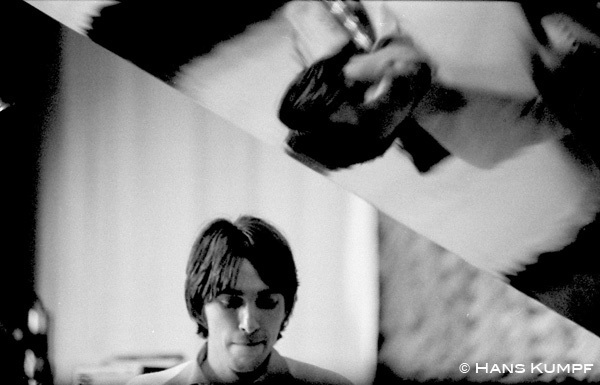 Hans Kumpf (born 1951) is one of those people without whom the jazz scene would not have been the same. A graduate in music, German and sociology, he works as a teacher. He is also active as a musician, playing with many European jazzmen. In 1979 he was voted No. 5 in the clarinet category of the 'Top People Poll' run by Jazz Forum. Hans Kumpf lectures on music theory, broadcasts, contributes to Jazz Podium, Jazz Forum and many German newspapers. He is also well known as a photographer, and has had several photo exhibitions in Ludwigsburg and Nürnberg. Since the beginning of the seventies Hans Kumpf has been a producer for his own record label, AKM Records, with releases featuring John Fischer, Perry Robinsoll, Theo Joergensmann, as well as many Soviet musicians: A. Vapirov, S. Kuryokhin, L. Chizhik, V. Ganelin, V. Tarasov, L. Saarsalu, and many others. In the middle of 1980 the teachers of a nearby technical school had planned a study trip to the Soviet Union. Winfried Koch, my clarinet-partner in AK-Musick, a German jazz group, worked as a teacher in the school. I heard about the project and decided to go along. Of course, I was curious about the jazz scene in the USSR, because as many as fourteen years earlier, at the age of fifteen, I had read an article, 'Jazz in the USSR' by Alexey Batashev in a magazine called Soviet Union Today. During my visits to Moscow I always got in touch with Alexey Batashev, but my other meetings with VIPs of the Soviet jazz scene happened more or less accidentally. Such was my discovery of the Contemporary Music Club in Leningrad. The friendly and cordial reception at this club made me come back to Leningrad and play with the local musicians. This was extremely gratifying because I happened to be the first free-jazz musician from the avant-gardists. I wrote about my impressions in various newspapers and magazines, trying to throw some light on the jazz scene in the Soviet Union. Of course, I travelled as a tourist with my clarinet and I financed these trips out of my own pocket. I managed to document some performances and later on I released them on records: Jam Session Leningrad (featuring saxophonist Anatoly Vapirov, pianist Sergey Kuryokhin and bassoonist Alexander Alexandrov); and Jam Session Moscow (featuring pianist Leonid Chizhik and saxophonist Alexey Zubov). Jam sessions in Tallinn, featuring saxophonist Lembit Saarsalu, pianist Vyacheslav Ganelin, drummer Vladimir Tarasov and a pianist, Rein Rannap, were released by Leo Records as Hans Kumpf - on a Baltic Trip. Even travelling in the Soviet Union with a regular group of tourists (which is, naturally, accompanied by the Intourist representatives) it is possible to move freely within the towns, on one's own, to get acquainted with the local jazz life. On the very first day of my stay in the USSR I heard about a big jazz concert which was to take place in the Leningrad Palace of Culture, named after Kirov (Sergey Kirov was a fellow-revolutionary of Lenin assassinated by one of Stalin's aides in 1934). It seemed a good idea for me to explore this monumental building. There were dancing halls, theatres, lecture rooms, ballet studios and many more cultural facilities. I had a chance to watch, for about half a hour, a dance in this 'Palace of Culture'. The Soviet 'Friday-night Fever' (entrance costs one rouble) took place in a quiet, subdued atmosphere and finished at eleven o'clock. There were about 150 couples dancing on the floor, most of them middle-aged. My attention was attracted by a girl wearing a T-shirt with 'Wrangler' written on it. Such clothes are considered to be a status symbol. The music was 'live' and conventional, played by the Veplinsky Big Band in a music-hall manner. A slow tune, 'Girl Talk', did not sound half as sophisticated as when it was played by Count Basie. Then the neon was turned back on, mercilessly, and the orchestra presented jazz pieces influenced by oriental folk music with Russian singing and traces of disco rhythms. In front of a greenish-red curtain embellished with folklore pictures the musicians were playing joylessly. The music lacked precision and improvisation. After an evening of ballet with works by Stravinsky and Khachaturian followed by pas-de-deux to the sounds of Pink Floyd I managed to find an open restaurant on Nevsky Prospect, one of the central streets in Leningrad. A quartet with guitar, piano, electric bass and drums, joined later by a female singer, was playing numbers by the Rolling Stones and Boney M without any inspiration. They also performed jazz standards, and the guitar player happened to be an admirer and imitator of George Benson and Wes Montgomery. Three times a week these musicians played background music and each of them got five roubles an evening. However, there were problems: the manager of the restaurant found their music too jazzy and not popular enough. In the Soviet Union too musicians are frustrated by commercial considerations. When we started a conversation these young musicians wanted to know, among other things, which harmonic extensions of the blues were practised in capitalist countries abroad. The drummer had a problem. He showed me a booklet with notations of a Yusef Lateef blues, which started with a C major 7 chord. It was all new to him, but subsequently we put together the chord as C-E-G-B. We went to the piano and I had to turn my theoretical explanations into sounds. My new friends asked me about Albert Mangelsdorff and they were surprised to hear that I knew him personally. And then there came a question which was to be repeatedly directed at me in the Soviet Union: the question about the financial possibilities of Western jazz musicians. Not everyone in the East understands that what appears to glitter in the West is not always gold. In another room of the restaurant a show called 'Disko' was on TV. Several young people, having danced in the TV studio to a hot and jazzy version of 'Summertime' by James Last, got the chance to talk to David Goloshchekin, one of the most popular Leningrad musicians, about the blues. Their discussion was accompanied by the sounds of 'St Louis Blues' and 'Rhapsody in Blue'. At the end of that TV programme Goloshchekin himself played a modern blues on his horn assisted by his rhythm section. Then the show continued, but with less spirit and more disco hammering away. Then, the next day, the Goloshchekin Ensemble was the main attraction of 'Bolshoi Conzert Dzhaza' (Big Jazz Concert) in the theatre hall of the Kirov Palace of Culture. The leader was blowing his horn, and by international standards he was rather mediocre. The sound of his violin was inspired by Stephane Grappelli, but he was more creative when he played it like a guitar, pizzicato. Finally, on an Erroll Garner tune he managed to create intense and emotional music. The other pieces interpreted by the David Goloshchekin Ensemble were written by Freddie Hubbard and Cannonball Adderley. The hit, however, was the title 'Sunny', which was announced as the song made popular by Boney M at the end of 1978, when this pop group did a couple of concerts in Moscow. During the jazz concert in the Palace of Culture there were five different groups. The most interesting contribution was made by a saxophonist, Anatoly Vapirov, and a pianist, Sergey Kuryokhin. While broken Debussy chords were played on the piano, Vapirov played softly on his soprano saxophone. On the tenor sax he demonstrated the kind of fragmentary flourishes that occur in fairly modern twentieth-century classical music, and on the alto sax his reverence for free jazz. At the end of his last number things were quieter and we heard some jolly ragtime. Even in the free passages there were no wild emotional outbursts; and this seems to me a special characteristic of Soviet jazz, especially in Leningrad. Even in relaxed moods order and discipline predominate, and there is no musical exhibitionism. Vapirov, who studied the classical clarinet and now teaches the saxophone at the Leningrad Musical Academy, is regarded as the leading avant-garde saxophonist in this city of four million inhabitants, while his partner Kuryokhin , who also uses 'prepared' pianos, like John Cage, is the chief avant-garde pianist. Dixieland is the speciality of Leningrad and Leningradski Dixieland, a group which was formed over twenty years ago, set the tone. Personally, I was disappointed by them. Dressed up as 'entertainers', what they offered were dolled-up imitations of dixieland standards. There did not seem to be any outstanding soloists and the combo had nothing like the power and vitality of the Polish old-time bands, for example. The jazz concert was put on by the jazz club Chorus (Kvadrat), which gives a big jazz concert every month and also arranges lectures and gramophone evenings. It was explained at this, the last concert of the season, that there were temporary difficulties over publicity, and that in future there would be a concert on every second Sunday in the month, with a programme announced in advance. Anyone interested could leave an address and he or she would be contacted. Hitherto they had simply used the usual Soviet method of publicizing cultural events; a hand-written poster - and, of course, the bush telegraph. The Contemporary Music Club is an offshoot of the Chorus and meets every Monday in the Lensoveta Cultural Hall. I was going to Moscow by the Red Arrow on Monday night, and Anatoly Vapirov therefore promised to organize a session for me that evening, offering to lend me his own clarinet. My watch let me down and I failed to be at my hotel when my jazz friends called for me. By taking a taxi I got to the concert ninety minutes late and found that some of the players - including Vapirov - had already gone, as well as a good many of the original audience. Since I had no instrument, we improvised an exchange of information about the latest developments in jazz and new music in West Germany. I was amazed to discover how well-informed these fifteen-odd intellectuals were about details of names and tendencies in modern music in the West. ECM and Mood Records discs were wellknown and critically rated, and I found myself being asked such questions as: 'What are Karlheinz Stockhausen's latest works?' 'How is avant-garde jazz developing in West Germany?' 'Who is the up-and-coming personality in German jazz and new music generally?' My answers to all these questions were not very enthusiastic, as there were, in fact, no really new tendencies to report. In the course of many conversations I discovered how hard it is for Soviet jazz fans to find out what is happening to jazz in their own country. Books and periodicals can be published only with government approval (and on government-allotted paper) and there is therefore inevitably a kind of 'underground press' for jazz. Even Jazz Forum, published in Warsaw, is rare. The chief source of information is therefore Willis Conover of the Voice of America, but he is not thought very highly of by 'progressive' jazz-lovers in the USSR on account of his conservative views. 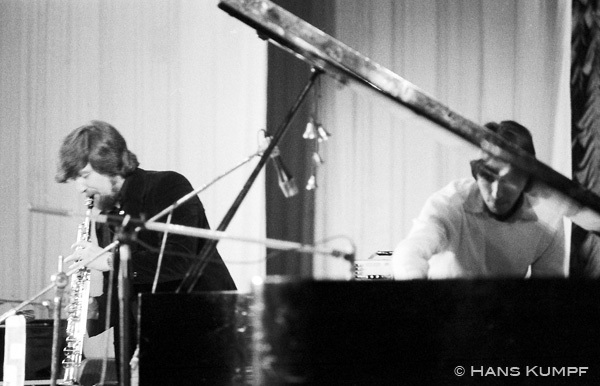 Even leading Soviet jazz players regarded an appearance at the Warsaw Jazz Jamboree as the height of their ambition. The jazz scene in Leningrad made a rather frosty impression on me, but there was plenty of warmth in the reception that I was given. The position in Moscow is quite different, both musically and personally. In Stalin's times there used to be propaganda placards showing a young rowdy with the legend: 'It's only a step from the saxophone to the knife'; or: 'Today he plays jazz and tomorrow he'll betray his country'. Anti-jazz propaganda of this kind in the Soviet Union is a thing of the past and those in the know are aware that President Kosygin, until his death in 1980, was a great jazz-lover and collector of records. I was told by a well-informed friend that Kosygin wanted to attend the jazz festival in Tallinn in 1967 and was prevented only by the death of his wife. The present coolness in East-West relations is not without its effect on jazz musicians in the Soviet Union. President Carter's boycott of the Olympic Games (in retaliation for the invasion of Afghanistan) was absolutely unintelligible to the average Soviet citizen. It was 'thanks to' that boycott that sax player Alexey Kozlov was giving a performance with his formation 'Arsenal', considered to be the chief jazz-rock band in the USSR. I heard Kozlov during my first day in Moscow. I had already written in advance to Alexey Batashev - author of Soviet Jazz and lecturer in jazz history at a music school with 600 students - and I rang him up that afternoon. It was arranged that I should telephone again that evening. He told me to go at once to the Theatre of Entertainment opposite the Kremlin, by the river, where he would give me a ticket for a Kozlov concert. We were to recognize each other by the Jazz Forum which we were supposed to carry. I was hunting in vain for a taxi in front of my hotel when I was hailed by a driver of a black limousine - in fact, an official State car - which at first struck me as rather fishy. We agreed on the price for a twenty-minute ride (five roubles) and I very soon realized the advantage of such a State car, which pays little attention to speed regulations or, for that matter, to red traffic lights. Any foot passenger who gets in the way is mercilessly honked at and neither time nor sympathy is wasted on any accident that may occur. Thanks to my express taxi I reached the theatre - which is regularly associated with jazz concerts - in good time (and even in one piece). I met Batashev and Kozlov himself, whom I agreed to meet again in the interval. He told me that he had played with the West German guitarist Toto Blanke at the Jazz Jamboree in Warsaw, his most Western appearance until then. He also asked a lot about both the financial position of jazz players in West Germany and the latest developments in the United Jazz and Rock Ensemble. He told me with great pride that Yevgeny Yevtushenko, then considered the greatest Soviet poet of the day, had been at his concert and would be writing a report of it for the German illustrated paper Stern. He also informed me that his trombonist, Vadim Akhmetgarev, was an admirer of Albert Mangelsdorff - a fact which was plain to any listener. The chords which Akhmetgarev produced by additional singing are even more precise than Mangelsdorff's. He uses this effect in a piece borrowed from Korean music. Otherwise there were Spanish and Indian folklore pieces and homage was paid to Prokofiev's Peter and the Wolf and - probably unconsciously - to the film composer Ennio Morricone. He also had some ragtime and free jazz, hard bop and cool jazz and even Jimi Hendrix cropped up. Judging from the programme, these dozen rock players model themselves on the United Jazz and Rock Ensemble. As far as instrumental technique goes, these Soviet jazz players have nothing to fear from comparison with their Western counterparts - neither the lively pianist Vyacheslav Gorsky at the synthesizer and the organ, nor Valery Kaznelson - the raw-toned tenor saxophone player, nor the percussionist Stanislav Korostelev, with his brilliant melodies, tone colours and rhythms. Individual titles were very carefully alternated with the light show put on by the normal lighting department of the theatre, emphasizing in excellent detail the various musical forms and structures. The transmission system was very metropolitan compared with that of Leningrad, and was in fact the Western Dynacord system. Performers also have stage monitors, which is not the usual Soviet practice. In a final conversation after the concert Alexey Kozlov told me about a jam session that was to take place the next day and gave me a ticket for the performance, which was already sold out. This session was a kind of supplement to the recently ended Moscow Jazz Festival which included twenty-six bands playing everything from dixieland to rock and free jazz. That year each group had to play one 'classical' jazz piece apart from works by Soviet composers and pieces connected with folklore. Concerts were given in the concert hall of the Composers' Union, which holds 500 people. Great Soviet composers look down from the walls, from Shostakovich onwards. In the cafeteria, posters with snapshots of the artists taking part hung from the ceiling, and propaganda titles, such as 'Soldiers of the great Red Army at a concert' or 'Meritorious workers in conversation with composers', abounded. The audience for jazz concerts is in marked contrast to this official image. Part of the audience is particularly smartly dressed in Western style. The majority belong to the middle generation, the young having not yet got around to jazz, though there are quite a number of young musical intellectuals. The hall, which was at first full, steadily emptied during the first item - three-quarters of an hour of a singer called Galina Filatova, who recalled the Swingle Singers, and an Ukrainian bass player Anatoly Baby with a production rather like something of Eberhard Weber's. Musically the whole thing was too monotonous, a real non-session – there were even prepared tapes of singing and bass music thrown in. In fact with the Spanish pieces 'Concierto de Aranjuez' and 'La Fiesta', there was more than a hint of kitsch. All too short, on the other hand, was the number contributed by the ensemble of Alexander Bukharov, who deliberately (I was told) combines pre-Christian Russian texts and music with today's rock. In my view Soviet jazz displays real originality arid worth when players are conscious of their own cultural history and identity and do not simply copy American models. The death, at the age of thirty-nine, of the Azerbaidjani pianist, composer and bandleader Vagif Mustafa-zade was a great blow to the Soviet jazz world, as he showed real genius in bringing new life to oriental folk music and jazz. The real jam session began after the interval. Seven horns and a rhythm section improvised on a thirty-two-bar ballad in the modern style. The temperamental tenor saxophone player from Arsenal, Valery Kaznelson, was one of the players and everything revolved round Nikolay Levinovsky (trumpet), who is also the keyboard player and leader of the Allegro group, 'one of the best', according to Alexey Batashev. Next came a dixieland interlude, and it occurred to me that old-time jazz is played more enthusiastically and (technically speaking) better, in Moscow than in Leningrad. Meanwhile there was a queue of sixteen players waiting patiently for their solos - queueing being not exactly unknown in the USSR ... The evening ended with 'C Jam Blues' and the modal modernists. Discipline and order rather than high spirits or joie de vivre were the keynotes of the evening, even here. And when it all ended at 11 p.m. there was none of the drinking that usually follows a concert in the West. I have noticed the same after other jazz concerts, both in Leningrad and in Moscow. Going back in the underground I had another glimpse of Nikolay Levinovsky. I could not help feeling that it was high time for Soviet jazz to emerge from the social underground.